Scunthorpe boosted their Championship survival hopes with a remarkable comeback against Sheffield United. Ched Evans' low drive and a fortunate finish from Richard Cresswell put the Blades on course for their first win under new manager Micky Adams. But Scunthorpe's Joe Garner converted a penalty before doubling his tally with a tap-in on the stroke of half time. Lee Miller headed the winner in the 53rd minute before Shane Lowry's late red card compounded the Blades' misery. 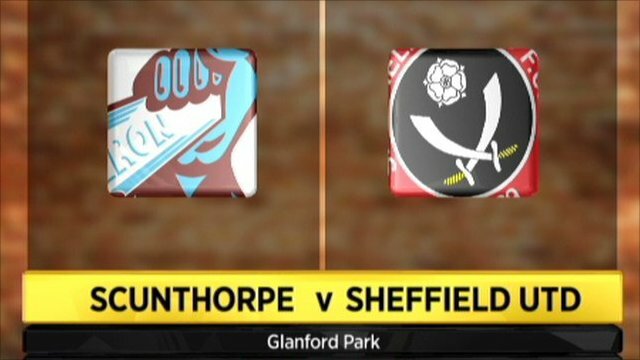 The result hands Scunthorpe a timely boost as they seek to avoid the drop but sends Sheffield United, now five points from safety, ever closer to League One. Evans opened the scoring in the sixth minute with a drilled left-footed shot from 15 yards after Scunthorpe had failed to clear a cross from the right-wing. The lead was then doubled in farcical fashion as Cresswell charged down a clearance from home goalkeeper Josh Lillis and watched on with delight as the ball rolled into an empty net. But the stirring comeback began eight minutes before the break as Garner powered home a penalty after he had been bundled over inside the box by Neill Collins. Scunthorpe then pulled level in the 44th minute when a deep free-kick from the right was headed across goal by Michael Nelson and Garner was on hand to tap home from close range. Worse was to follow for the Blades as they were undone by another set-piece eight minutes into the second half. Duffy floated over another dangerous ball from the right and Miller rose above his marker to plant a firm header past Steve Simonsen. The Blades ran out of steam as the full-time whistle approached, however, and their misery was compounded by the late dismissal of Lowry, who brought down Garner as he broke clear. 90:00+5:32 The referee signals the end of the game. 90:00+4:50 Free kick awarded for a foul by Neill Collins on Joe Garner. Michael Nelson takes the free kick. 90:00+4:32 A cross is delivered by Ched Evans, Paul Reid manages to make a clearance. 90:00+4:03 The ball is swung over by Bjorn Helge Riise, blocked by Ben Gordon. 90:00+3:09 Marcus Bent concedes a free kick for a foul on Michael Raynes. Michael Nelson restarts play with the free kick. 90:00+1:13 The ball is swung over by Daniel Bogdanovic, clearance by Michael Nelson. Corner taken by Bjorn Helge Riise from the right by-line, Michael Raynes manages to make a clearance. Effort from just outside the area by Michael Doyle goes over the target. 90:00+0:25 Foul by Josh Wright on Michael Doyle, free kick awarded. Steve Simonsen takes the free kick. 89:56 Unfair challenge on Lee Miller by Michael Doyle results in a free kick. Direct free kick taken by Lee Miller. 89:10 Abdisalam Ibrahim has a drilled shot. Save made by Steve Simonsen. 88:09 Shane Lowry concedes a free kick for a foul on Joe Garner. Josh Wright takes the direct free kick. 88:09 Sent off Shane Lowry receives a red card. 87:04 Bjorn Helge Riise challenges Joe Garner unfairly and gives away a free kick. Direct free kick taken by Ben Gordon. 84:48 Josh Wright crosses the ball. 84:03 Inswinging corner taken right-footed by Josh Wright played to the near post, Matthew Lowton manages to make a clearance. 83:36 The referee gives a free kick against Josh Wright for handball. Steve Simonsen restarts play with the free kick. The ball is delivered by Matthew Lowton, save by Josh Lillis. 82:18 Substitution Michael Raynes on for Mark Duffy. 80:17 The assistant referee flags for offside against Daniel Bogdanovic. Josh Lillis takes the free kick. 80:07 The ball is sent over by Ched Evans, Michael Nelson makes a clearance. 79:37 Free kick awarded for an unfair challenge on Daniel Bogdanovic by Ben Gordon. Bjorn Helge Riise takes the direct free kick. 78:38 Mark Yeates produces a right-footed shot from deep inside the penalty area which goes wide of the left-hand post. 78:38 Substitution Abdisalam Ibrahim replaces Sam Togwell. 76:59 Free kick awarded for an unfair challenge on Mark Duffy by Shane Lowry. Shot on goal comes in from Josh Wright from the free kick. 75:36 Substitution (Scunthorpe) makes a substitution, with Michael Collins coming on for Andy Hughes. 74:57 Centre by Stephen Quinn, clearance made by Andrew Wright. 72:12 Substitution Mark Yeates is brought on as a substitute for Nyron Nosworthy. 71:32 Mark Duffy takes a inswinging corner from the left by-line to the near post, clearance by Nyron Nosworthy. The ball is swung over by Mark Duffy, clearance by Matthew Lowton. 70:37 Andy Hughes gives away a free kick for an unfair challenge on Matthew Lowton. Bjorn Helge Riise delivers the ball from the free kick right-footed from right channel, Paul Reid manages to make a clearance. 70:37 Substitution Richard Cresswell leaves the field to be replaced by Marcus Bent. 68:19 Centre by Ched Evans, Daniel Bogdanovic takes a shot. Josh Lillis makes a comfortable save. 67:31 Effort from deep inside the area by Ben Gordon misses to the left of the goal. 66:12 Paul Reid challenges Ched Evans unfairly and gives away a free kick. Bjorn Helge Riise crosses the ball from the free kick right-footed from right channel, clearance made by Michael Nelson. 64:16 The ball is crossed by Stephen Quinn, clearance made by Michael Nelson. 61:56 Neill Collins gives away a free kick for an unfair challenge on Joe Garner. Direct free kick taken by Andrew Wright. 60:56 Substitution Daniel Bogdanovic joins the action as a substitute, replacing Johnny Ertl. 59:29 Mark Duffy gives away a free kick for an unfair challenge on Bjorn Helge Riise. Free kick crossed right-footed by Bjorn Helge Riise. Stephen Quinn delivers the ball, Michael Nelson manages to make a clearance. Stephen Quinn delivers the ball, save by Josh Lillis. 59:10 Lee Miller challenges Nyron Nosworthy unfairly and gives away a free kick. Nyron Nosworthy takes the free kick. 58:39 Joe Garner takes a shot. Save by Steve Simonsen. 58:04 Inswinging corner taken by Bjorn Helge Riise, Josh Lillis makes a save. 57:20 Andrew Wright crosses the ball, clearance made by Nyron Nosworthy. The ball is crossed by Ben Gordon, Neill Collins manages to make a clearance. 56:13 Effort on goal by Richard Cresswell from just inside the penalty box goes harmlessly over the target. 55:41 The referee penalises Michael Nelson for handball. Shane Lowry restarts play with the free kick. 55:41 Booking Booking for Michael Nelson. 53:13 Stephen Quinn crosses the ball, clearance made by Michael Nelson. 52:05 Shane Lowry challenges Lee Miller unfairly and gives away a free kick. Assist on the goal came from Mark Duffy. 52:05 GOAL - Lee Miller:Scunthorpe 3 - 2 Sheff Utd Lee Miller scores a headed goal from inside the six-yard box. Scunthorpe 3-2 Sheff Utd. 50:37 Shot from outside the penalty box by Sam Togwell goes wide right of the goal. Correction - 49:20 Stephen Quinn concedes a free kick for a foul on Andrew Wright. Josh Lillis restarts play with the free kick. 49:20 Stephen Quinn concedes a for a foul on Andrew Wright. 49:20 Booking Booking for Stephen Quinn for unsporting behaviour. 48:58 The ball is sent over by Andy Hughes. 47:36 The referee blows for offside. Indirect free kick taken by Josh Lillis. 46:42 Free kick awarded for an unfair challenge on Ched Evans by Andrew Wright. Free kick taken by Bjorn Helge Riise. 46:01 The ball is crossed by Bjorn Helge Riise. 45:31 Centre by Bjorn Helge Riise, Richard Cresswell takes a shot. Save by Josh Lillis. 45:00+3:11 The match has reached half-time. 45:00+1:56 Free kick awarded for a foul by Josh Wright on Ched Evans. Free kick crossed right-footed by Bjorn Helge Riise from left wing. Nyron Nosworthy is ruled offside. Josh Lillis takes the free kick. 45:00+0:44 Stephen Quinn fouled by Andy Hughes, the ref awards a free kick. Steve Simonsen takes the free kick. 45:00+0:33 Richard Cresswell is caught offside. Michael Nelson takes the free kick. 43:50 Shane Lowry concedes a free kick for a foul on Joe Garner. Assist by Lee Miller. 43:50 GOAL - Joe Garner:Scunthorpe 2 - 2 Sheff Utd A goal is scored by Joe Garner from inside the six-yard box to the bottom right corner of the goal. Scunthorpe 2-2 Sheff Utd. 40:40 Ched Evans has an effort at goal from just inside the box that misses to the left of the target. 39:46 Drilled left-footed shot by Michael Doyle. Save by Josh Lillis. 37:23 Ched Evans takes the chance to get an effort at goal. Josh Lillis makes a save. 36:08 Penalty awarded for a foul by Neill Collins on Joe Garner. 36:08 GOAL - Joe Garner:Scunthorpe 1 - 2 Sheff Utd Penalty scored by Joe Garner. Scunthorpe 1-2 Sheff Utd. 33:45 The ball is crossed by Ben Gordon, clearance by Matthew Lowton. A cross is delivered by Andrew Wright. 29:45 Free kick awarded for a foul by Andrew Wright on Stephen Quinn. Neill Collins takes the free kick. 29:45 Booking Booking for Andrew Wright. 28:39 Joe Garner fouled by Johnny Ertl, the ref awards a free kick. Mark Duffy crosses the ball from the free kick right-footed from left wing, Richard Cresswell makes a clearance. 27:36 Mark Duffy fouled by Ched Evans, the ref awards a free kick. Free kick taken by Paul Reid. 24:24 Bjorn Helge Riise has an effort at goal. 21:07 A cross is delivered by Ben Gordon, Joe Garner takes a shot from 18 yards. Shane Lowry gets a block in. Inswinging corner taken by Mark Duffy, Michael Nelson takes a shot. Shane Lowry makes a clearance. 20:39 Unfair challenge on Andrew Wright by Stephen Quinn results in a free kick. Andrew Wright restarts play with the free kick. 18:04 Ched Evans takes a shot from 35 yards. Josh Lillis makes a save. 16:35 Unfair challenge on Josh Wright by Michael Doyle results in a free kick. Paul Reid restarts play with the free kick. 16:00 Free kick awarded for a foul by Andrew Wright on Richard Cresswell. Stephen Quinn takes the direct free kick. 15:24 Ched Evans takes a shot. Save made by Josh Lillis. 12:53 Josh Wright fouled by Richard Cresswell, the ref awards a free kick. Andy Hughes restarts play with the free kick. 11:40 A cross is delivered by Neill Collins, clearance by Michael Nelson. Shot by Michael Doyle. Blocked by Paul Reid. 11:17 Foul by Ben Gordon on Neill Collins, free kick awarded. Free kick taken by Neill Collins. 8:56 Matthew Lowton produces a cross. 8:02 Free kick awarded for an unfair challenge on Michael Nelson by Ched Evans. Josh Lillis restarts play with the free kick. 6:09 GOAL - Richard Cresswell:Scunthorpe 0 - 2 Sheff Utd Richard Cresswell finds the back of the net with a goal from the edge of the area to the bottom left corner of the goal. Scunthorpe 0-2 Sheff Utd. 5:03 GOAL - Ched Evans:Scunthorpe 0 - 1 Sheff Utd Ched Evans gets on the score sheet with a goal from just inside the area to the bottom right corner of the goal. Scunthorpe 0-1 Sheff Utd. 3:54 Josh Wright sends in a cross, Joe Garner takes has a header from just inside the penalty box which clears the crossbar. 3:19 Nyron Nosworthy crosses the ball, save by Josh Lillis. 2:21 Corner taken by Bjorn Helge Riise from the right by-line, Paul Reid makes a clearance.